This is the greatest and most extreme makeover that any human being will ever have in their life. And this extreme makeover is the most amazing transformation of anything that there is in the universe. Human beings are termed positional, declarative and definitively sanctified. But this is not an outward, beautifying makeover, as the world focuses on. This is an inward beauty that God does from the inside out. This shocking biblical truth is that humans can undergo a transformation, a renewing, a leaving of their finiteness, to become new creatures. To be or not too be, the famous Shakespeare quote, become the “too be” of today and forevermore. What was once finite, becomes eternal; what was once corrupt, becomes holy; what was once malformed; becomes transformed; what was once blemished, becomes spotless. But this takes a power that no human possess. What is begun in an instant will last for an eternity. This happened the moment the carnal was re-born as spiritual. Most people celebrate their birthday, but this is actually a re-birth day. A new creature is born, but this one will never, ever die. Second Corinthians 5:17 is clear about this new creation: “Therefore, if anyone is in Christ, he is a new creation; old things have passed away; behold, all things have become new“ (NKJ). This happened when “…you were washed, you were sanctified, you were justified in the name of the Lord Jesus Christ and by the Spirit of our God” (I Cor. 6:11). Your justification is instantaneous; your sanctification is a lifelong process. You became “holy” and “righteous” in a split second (John 15:1-5, Gal 2:20, Col. 2:6-7, Eph. 2:4-6, et. al). It’s as if God branded you immediately, and stamped “holy” on you, with that redemptive seal to remain there forever (James 3:2, I John 1:8). Not only that, you became His possession and any possession of God’s that He claims, remains His property forevermore (John 6:37, 10:28-29). He called me out of the darkness and “…into His marvelous light” (I Pet. 2:9) because I needed Someone to save me. Now death has lost its power and no longer holds dominion over me anymore (Rom. 6:9-11). After our re-birth, we begin to love a world that is in need of a Savior and that’s why we desire, or at least should desire, to tell others about Him. But our sanctification is a lifetime process, a fight against our own nature and flesh. It is a progressive sanctification and this journey of sanctification is continuous until our glorification at our death or at Christ’s return, whichever comes first. We are called holy immediately, but we are in the process of becoming holy too. There is a mortification of sin in our members. The difference now is that we want to fight sin and want to bring glory to Him. Thank God, literally, that we don’t have to fight this fight alone or we would have no chance at all of winning (Rom 8:13-18). Our transformation through sanctification is changing one human, carnal image into the glorious image of the Son of God (2 Cor. 3:18). The Holy Spirit each and every day helps us with this transformation, working directly in us, but by God’s strength, not ours, or we would fight a losing battle (Eph. 4:23-24). Thus, we are called to “walk in a manner worthy of the Lord, fully pleasing him, bearing fruit in every good work and increasing in the knowledge of God” (Col 1:10). We wouldn’t eve have the desire to grow in this knowledge if God did not instill this in us at our re-birth. The late Adrian Rogers once said of salvation; born once, die twice, born twice, die once. With Jesus’ atonement applied to us, we can work on becoming a living pillar of salt. Since we have been termed positional, declarative and definitively made over, we are as good as in heaven already, at this present time. If you have not has this extreme makeover yet, read below how you can, at this very moment in time, become declared holy, on this very day, and at this exact moment. And there you will remain in Him forevermore. Don’t feel worthy? Join the club. He has made us worthy. Now, we all feel unworthy at times, lonely, depressed, and sometimes fear we have lost our salvation. Sin spurs these feelings of a salvation lost. But will you depend upon your feelings about the assurance of your salvation, or will you depend upon the sure and certain Word of God. Let’s see; believe my feelings or believe God’s Word which abides forever. No contest. This certainty of victory ought to make us feel like the athlete that won an overtime game with a last second shot. Let’s celebrate. it’s the biggest victory ever won, anywhere and for all time. You have no reason to doubt this victory. And the uphill battle of sanctification should not defeat our attitude. Here is why: It’s not all up to you. You’re not left alone. Our salvation is not all our responsibility; it is our response to His ability and as I have said before, holiness is not the way to Jesus, Jesus is the way to holiness. Similarly, good works are not the way to holiness, holiness is the way to good works; His holiness. If, today, you are unsure or you have never been certain of your salvation, here is how to make certain of it. 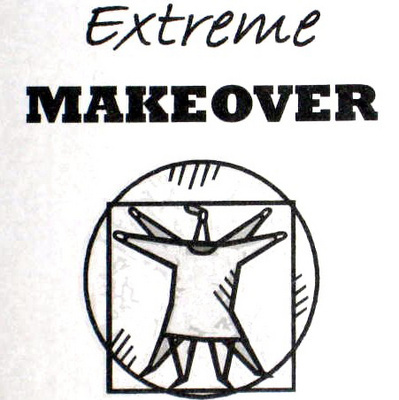 Right now, you can have the greatest eternal and redemptive extreme makeover that there is possible. If you have just received Jesus, you have now received God’s inheritance rights since you are now a son or daughter of His and can never be lost again & live forever (John 10:28-29). Now, join a Bible-believing church, or call 1-888-NeedHim (633-3446) for follow up questions about salvation that is only available through Jesus Christ. Please remember that our salvation is not all our responsibility; it is our response to His ability. Beautifully stated. It is about as extreme as it gets for human beings.